After I believed in Value investing, it was as if I found a new way to have an extra income, to achieve my financial freedom sooner. My path hit an obstacle shortly after because an ingredient was amiss, Patience. It was 2014 when Kepland was delisted, refer here for my story. I was like why would I wait any longer since investment can earn more money? I executed my investment plan with more than 80% of my savings. I bought the banks, telcos, reits, which I thought it would be safer. I am holding growth and dividend stock, and these are companies with good and reputable stock with good track records, just buy and hold and wouldn't go wrong. 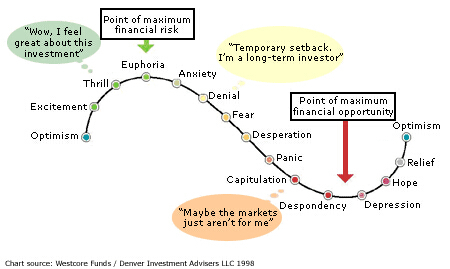 I bought all the way till Apr 2015, some may called it the euphoria stage of the market. As you had guessed, the "Oil Crisis". STI dropped from high of 3500 to low near 2500, and most of my shares were bought when STI is around 3300. The best part is the news about entry of the 4th Telco in Singapore, hit the once "stable" telcos stocks heavily, especially M1. The telcos' prices dropped more than I had expected. Although I knew about the news since 2014, the market only affect the prices much in 2015 after I bought the telcos shares, am I unlucky? Sometimes it is not about how good the company is, but is about when would you execute your plan to buy. Timing and of course luck plays a part. Alternatively, one way to do this is do not buy all the shares at one shot, dont rush into the market. Buy them gradually over a period with strategically average up or average down at a percentage which you are comfortable with. Although companies maybe good, but we cant time it to get the best price, so average them out and buy them over a period may be a better choice. Patience do plays in another point of view, because soon after I just learned that stock needs to be patience, I am glad that I didn't push the panic sell button. Although I'm still holding a red portfolio, at least it recovers over 10%+ with a two months. Guess I had more needs to learn. 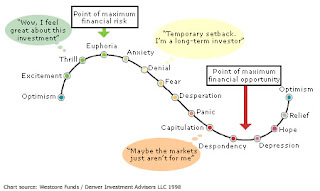 Euphoria stage, market's mood as described by forbes article.